An Asian-style marinated mushroom recipe makes a great side dish. It also works well as a topping for rice, noodles, and salads. There's lots of room to be creative depending on which flavors you want to highlight. Add sake for a more Japanese style, or increase the amount of soy sauce and sesame oil for a different taste. You could even add some fish sauce or tamarind. The recipe below will get you started, but feel free to experiment to suit your tastes. 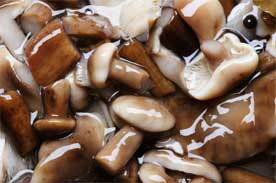 Place the mushrooms in a container with the soy sauce, rice wine/vinegar, sesame oil, garlic and ginger. Let them marinate for at least an hour, preferably overnight. Place all the ingredients in a saucepan and bring to a boil, adding some water if more liquid is needed. Cook for 5 minutes. If a crisper texture is desired, sauté in a skillet instead. Remove mushrooms and place in a dish. Continue to cook the marinade until it has a thicker, more syrupy texture. Pour over mushrooms and serve. Add a chopped red chili or 2 tsp of chili powder for some extra heat. Add a tsp of lemon or lime. Chop and saute half a red onion to add to the finished mushrooms. Alternatively, you can add some chopped green onions as a garnish. A tsp of fish or oyster sauce will impart a saltier flavor. I like to cook the mushrooms in an actual skillet for a bit first but cooking everything together is fine too. If you give the dish some time to sit afterwards the flavors will meld together even more!